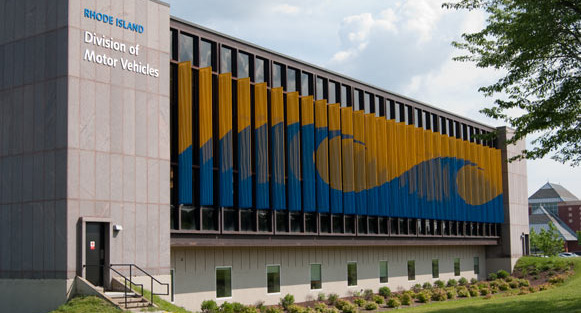 The Rhode Island Division of Motor Vehicles recently moved into the Aime J. Forand Building in Cranston. The 70,000 square foot headquarters replace the previous and "temporary" DMV that was located in Pawtucket. The new DMV has twenty-eight license and registration counters, a cafe, and provides generous open spaces. The Aime J. Forand Building was repurposed and renovated by Lerner, Ladds Bartels Architects and Dimeo Construction. Malcolm Grear Designers developed the exterior and interior wayfinding system for the building.